The Golden Circle is very popular among tourists and with a good reason: the route gives you a chance to see the most famous sights in South Iceland, to enjoy stunning and unique Icelandic nature. While traveling around Golden Circle, you will see geysers, a volcano crater, a waterfall and a famous national park, and you can do it in one day trip. We know, it sounds totally unbelievable! So let’s look at the route in more details. It is important to say, the Þingvellir is more than just a park, for many years an open air assembly Althing, which represented Iceland, took place here. A magnificent spot was founded in 930 and the the Parliament met there till 1798! So apart from spectacular views, this ancient park played a vital role in Icelandic history and there are many spots that can remind you of Althing, for example dozens of booth, that were built from turf and stone. So it is not a surprise that this park became a World Heritage Site in 2004. In the park, you will find the information centre, where you can learn more about the history of this place. Also there are two places for camping: Leirar, that is located near the information centre, and Vatnskot, that can be foundnear the lake. The park has two diving spots: Davíðsgjá and Silfra, the latter is one of the most popular places among divers in Iceland. The waterfall is one of the main stops in the route and rightfully so. 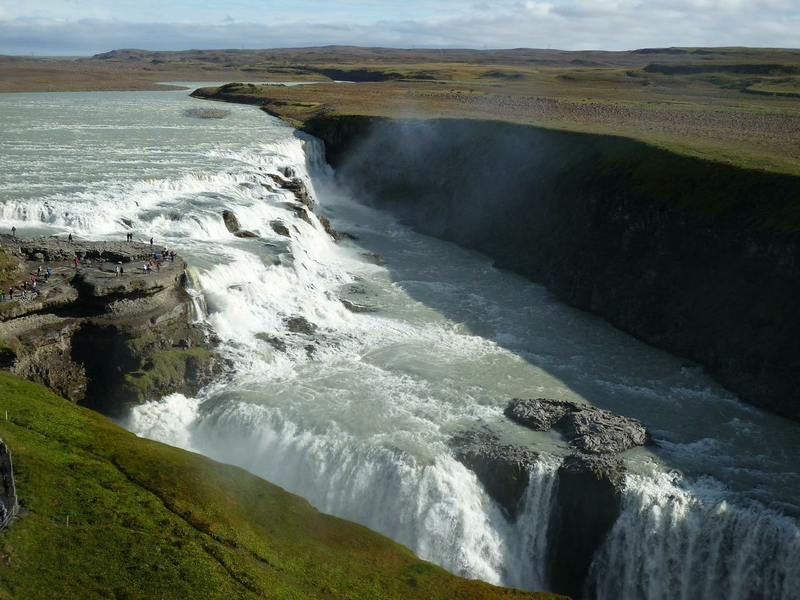 It is one of the most famous waterfalls in Iceland and also one of the most powerful in Europe. It has two tiers and was formed during an interglacial period. Situated in the river Hvita, the waterfall is called “Golden Falls”, because on particularly sunny days the colour of the water looks gold. Also sometimes it is possible to see a rainbow over the waterfall. The scenery is so breathtaking, that you can spend hours taking photos there. Apart from aesthetic enjoyment, the powerful and unique atmosphere of the place will boost your energy and brighten your mood. Certainly a “must see” sight! We know that after visiting national park Pinvellir and Gullfoss you will be already overwhelmed with the striking landscapes and beautiful features of untouched nature, but Haukadalur is worth mentioning. The sight is famous for its geysers, the most notable are Strokkur and Geysir. Unfortunately Gaysir, which is probably the most famous of geysers, as the word actually derives from its name, is not active anymore. However, Strokkur is still active and erupts every 10-15 minutes. Besides geysers, you will see many other geothermal features, such as mud pots and fumaroles. The Golden Circle is definitely an outstanding experience, you can take the route either by yourself or by tour guide. Of course, it depends on personal preferences, but if you want to enjoy each stop on your own term and don’t depend on others, exploring the Golden Circle by yourself might be one of the most unforgettable experience in your life!